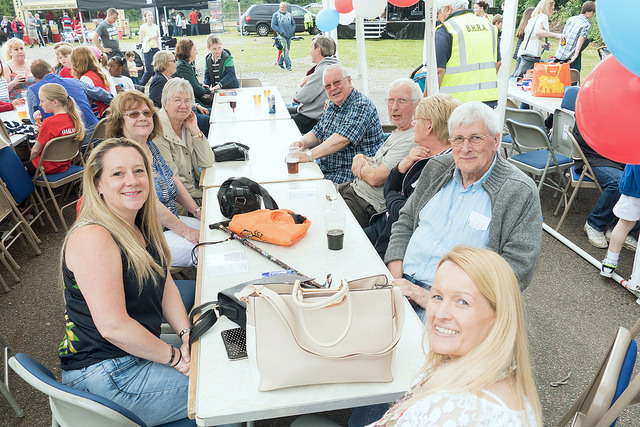 Over 500 people joined us to share a fantastic street party for the Queen’s 90th Birthday. Despite the changeable weather, at the Charles Darwin Leisure Centre we held a parade of Disney characters, an outdoor and indoor Gymnastic display and an Oaklands v Biggin Hill Primary Schools’ sports day tribute to the Queen. There was also an under 5’s play area and variety of stalls raising money for local charities. Over the road at Blundells we had a full stage set up with two brilliant bands, ‘Life of Brian’ & ‘The Cray’ providing live music while people enjoyed drinks, ice creams snacks and lunch (including food from the amazing Shampan). We also had vintage military car rides raising money for charity and the Biggin Hill Fire Brigade joined us with their fire engine. We’d like to thank all who gave their time and skills for the benefit of the Community and to other professionals who offered their services at a greatly reduced cost. Finally, this was funded by local organisations and by individuals. We are able to ‘’put back” and “add value” to the life of the Community through their and your generosity. We are happy to run events like this at minimal cost, but we rely, for the larger part, on membership within our residents. Please, please consider joining our membership! For £5 a year for each household so much can be done to enhance our village. Last year we were able to provide defibrillators in key positions, we were also able to provide grants to local organisations. We can do much more but need the cash to do it. Please, if you can, do join our increasing membership. Five pounds a year? A bottle of average wine, four or five litres of unleaded……?